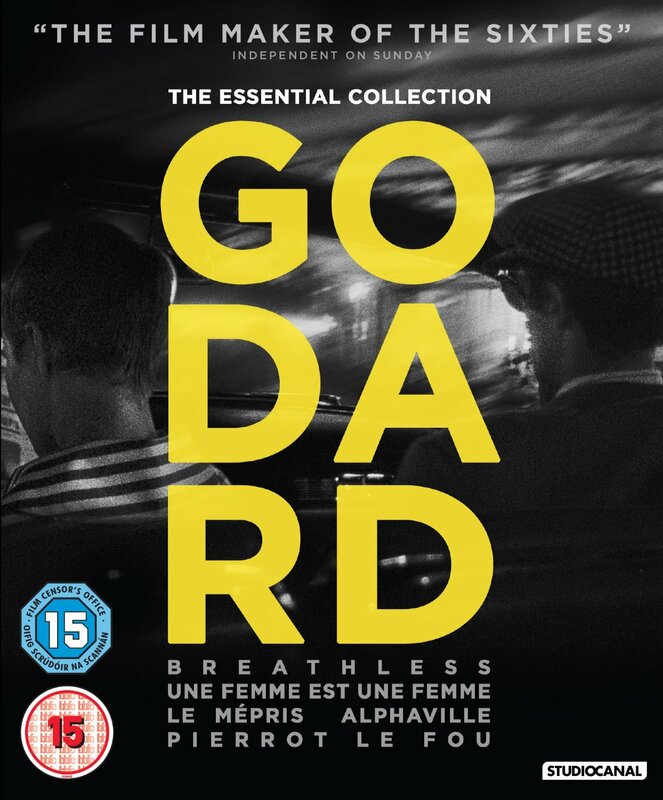 Collection of five films from writer/director Jean-Luc Godard, presented in a beautiful 5 disc Blu-ray box set. Breathless (1960) follows the brief love affair between petty criminal Michel (Jean-Paul Belmondo) and young American student Patricia (Jean Seberg). Michel has killed a motorcycle cop and is now hiding out in Patricia's Paris apartment, but the police are getting closer, and as Michel falls deeper in love with Patricia his time also gets shorter and shorter. In Une femme est une Femme (1961), Godard deconstructs the classic MGM musical in the first of his films to star then wife Anna Karina. Nightclub stripper Angela (Karina) wants to have a baby but her lover Emile (Jean-Claude Brialy) refuses to co-operate. Angela threatens to get pregnant by the first man that comes along and Emile suggests his friend Alfred (Belmondo), who is in love with Angela. In Le Mépris (1963), aspiring playwright Paul Javal (Michel Piccoli) finds himself caught between the creative director (Fritz Lang) and the crass American producer, Jeremy Prokosch (Jack Palance), on a movie adaptation of Homer's epic poem 'The Odyssey'. While the director wants to faithfully recreate Homer's world artistically, the producer demands a more commercial feature and waves his mighty chequebook to make it happen. When Paul finds himself swayed by the power of the producer's money his wife Camille (Brigitte Bardot) begins to regard him with increasing contempt. In Alphaville (1965), private eye Lemmy Caution (Eddie Constantine) is catapulted into space and ends up in Alphaville, a city run by domineering scientist Dr von Braun (Howard Vernon). After Caution sees his chief contact being killed, he becomes determined to strike at Alphaville's cold heart: a powerful computer system that stamps out all traces of individuality and emotion in the populace it controls. In Pierrot le Fou (1965), Ferdinand (Belmondo) leaves his wife and child and runs off with the babysitter, Marianne (Karina). The pair head south to find Marianne's brother, with Ferdinand getting caught up in Marianne's crimes along the way as they both spiral toward destruction.